Forget what’s on the catwalk, Socialite Rank has highlights of the real action – what’s happening on the front row. Covering Fashion Week from a different perspective, the website is bringing you all the goss from the inside. Personally i’ve never heard of half the celebs mentioned, but makes for fun reading nonetheless! Elixir- The Answer to Ageing? Announced today: the launch of the world’s first glossy magazine devoted to anti-ageing and rejuvenation! Elixir will go on sale on Februaury 16th, full of information on the hot new anti-ageing products and services available globally. The magazine will cover an array of topics including nutraceuticals, cosmeceuticals, fitness, cosmetic surgery, cosmetic dentistry, spas and medical anti-ageing and rejuvenation therapies, as well as including a column on opportunities to invest in global stocks in the sector such as Allergen (Botox) and Pfizer (Viagra). With the anti-ageing market growing at an astounding pace and new products and services being launched weekly, Elixir targets its content towards a 30+ audience of affluent women and men who are keen to defy the laws of nature. It’s a worrying trend but it seems that growing old naturally is so last year. 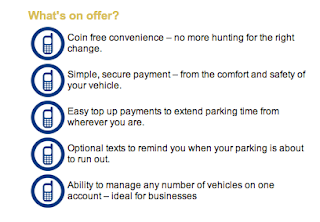 Westminster Council have launched a 6-month trial of a new pay by phone parking facility in large areas of the West End. Covent Garden and Soho will see all parking meters removed and replaced by ‘Pay by Phone Only’ bays, and Pay & Display areas will include pay by phone options.